The challenge is to design a synthetic hitbox adapted to BF1 data to apply in calculators. From the firts file we know the soldier (or rather, their appearance) will be 1.70 m high because it takes a stooped posture, and the eyes will be at y=1.60 m.
There is one capsulle for " head", two for "spine", two for each leg and two for each arm. I use a Bf4 soldier image because I haven't images of BF1. Since the sum of capsule lengths is much greater than the height of soldier must be overlapping (the file has priority criteria, surely to apply bigger damage). An important issue is the capsule defined as member(1): "spine" must be included in the member (2): "spine". If membre(1) represents the chest that means is much larger than we thought, because it is almost a sphere of radius 0.25 m. It is the area that would cover a bulletproof vest, leaving only the small exposed underbelly. 1.Each partial hitbox height will be the same height of the equivalent capsule discounting overlapping because that is important in relation to recoil and the probability of moving from a low damage hitbox to a high damage hitbox. 2. 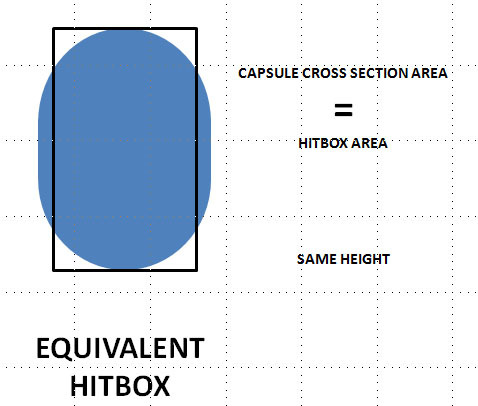 The area of each partial hitbox will be the same as the equivalent capsule discounting overlapping. So the probability of impact with uniform distributions (spread) will be the same. 1.70 m high, almost same area for head, chest and belly partial hitboxes, and legs forced to have the same width than belly, so we can compute belly and legs together as a single rectangle, if they have the same multiplier. Thighs are properly evaluated and only the lower part of the legs is overrated, but that's not important if we aim to head, chest or waist. In fact the hitbox would work properly cut at the knees. Arms are not included because they have a large overlap with the body and never are aligned with it. Multipliers will be soon (Miffyli has promised ). It only remains to solve the hitbox. The problem described in the previous post is that the distribution of the capsules suggests that the entity "chest" (multiplier 1) is much larger than assumed in BF4, where normally we called "upper chest" (30 cm or so ). In fact it seems that "chest" is a sphere about diameter 50 cm and it is to the area covered by a bulletproof vest. This would change the results aiming to the intuitive center of masses (usually all shots multiplier would be 1 and only accidentally shot would have multiplier 0.93, or appropriate in BF1). 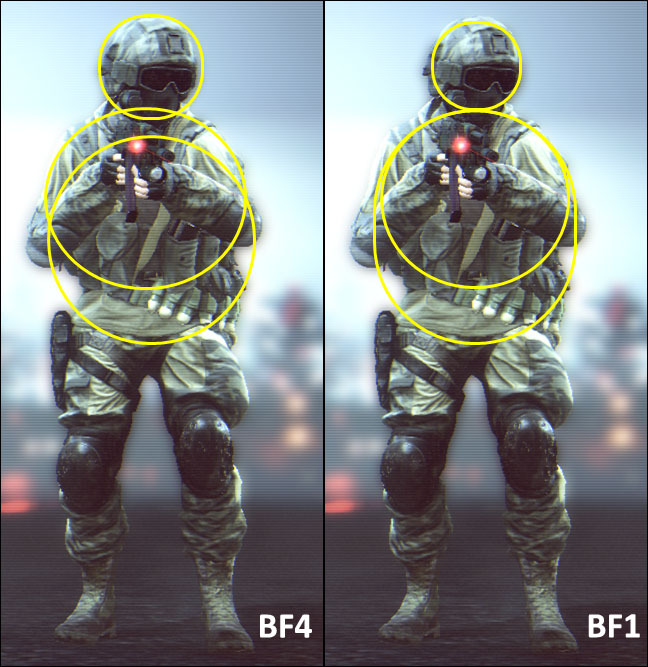 Here is the comparison of capsules and BF1 BF4. The position is assumed. I think one needs to remember to take into account the third dimension here too when capsules can overlap in the third dimension. I.e. Upper body has smaller "hitting probability" in 3D compared to 2D representation. One new problem with BF1 is that arms are now in two parts (upper arm and forearm), and ADSing soldiers have hands in front their torso/chest. The "2D hitbox" from shooter's perspective will thus have less upper-chest hitbox visible, because these hands are in front of them. The "trans" vector specifies bone's location relative to soldier's position. 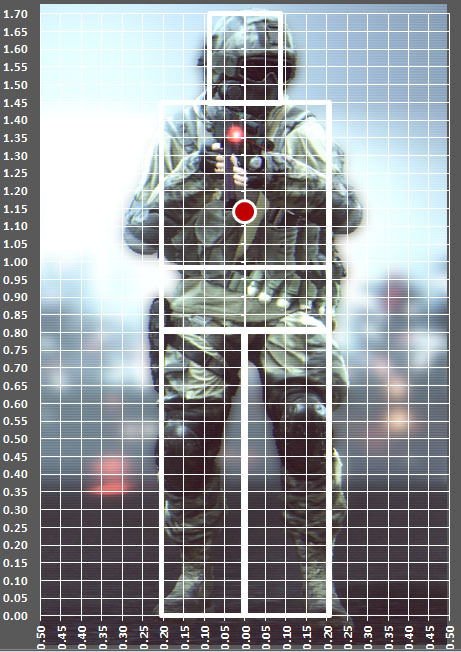 Soldier's (0,0,0) position appears to be between feet when soldier is standing (see the red box in attached image). "forward" vector probably shows the direction of bone, so if one of the capsule's points is at "trans" then endpoint is at "trans + forward*length". Also will provide multipliers quite soon! Edit: I quickly tried visualizing bones in three.js's editor. You can try it by downloading this scene file, going to three.js / editor and importing downloaded file. You need to scroll in a bunch though. Also I didn't include arms etc. Forget for the moment the third dimension. It is confusing enough in 2D. They are indicating that there is a system of priorities in case of coincidence. My hypothesis (just hypothesis) is the most damage is attributed (as if the bullet pass through the minor priority). The head has the highest priority. 2. I spent a few hours trying to understand the file structure without success. The top two points make sense: the center of the head and chest. Each one in its capsule. But not the following points. One seems to be centered on the lower abdomen. The capsule is member (2) "spine" and is 65 cm high. 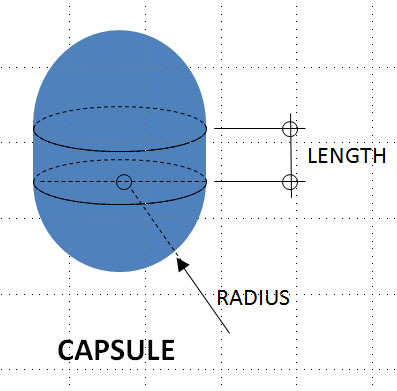 That point can not be the center of the capsule. The lower points clearly correspond to the knees (not the center of the capsule of upper leg). In this case they would be the base line (or better pivot point). Lower leg has not vector "trans". So...always (0,0)...that is base line. 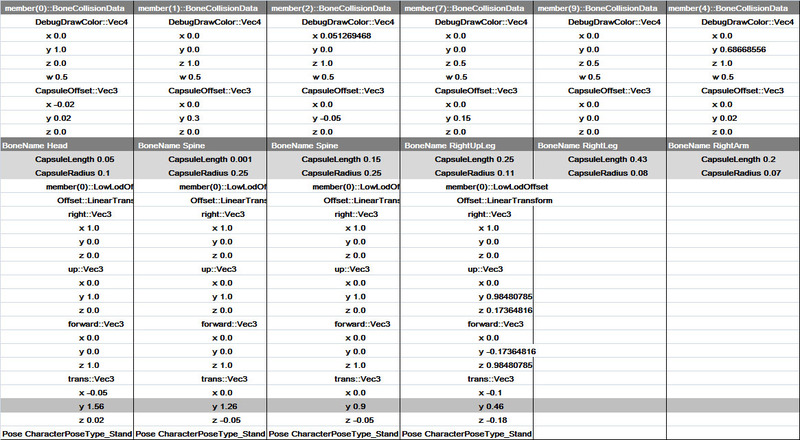 Adding or subtracting CapsuleOffset ::vec3 or forward :: vec3 adds more confusion. The translation you propose ( "trans + forward*length") doesn't affect to head and both "spines" in XY plane. I can not find a homogeneous criterion for "trans" (center, base, top...???). In any case this does not solve the main question. In BF1 there is a capsule "spine" 65 cm high covering from crotch to the shoulders (there is no other possibility) and a smaller 0.50 m capsule, "spine" too, that have to be included in the bigger one, leaving only 15 cm of margin, above (upper chest) or down ( belly). My hypothesis is the smaller capsule (0.50 cm) is "chest" and must have priority or never would be hitted because is included inside of bigger one (0.65 cm). It would make sense to have prioritization in hitboxes, however the object you linked seems to be used for aimassist instead of hitboxes. You can't really use "under reticle" either since we're talking about flying projectiles, not aiming vector. The smaller ones look weird, so they are probably attached to other bone (ie. location is relative to that bone). These seem quite correct and similar to what BF4 had. I didn't even try adding legs for now because of rotations, but the start looks good. I didn't even try adding legs for now because of rotations, but the start looks good. It looks good because you dont paint legs. The base of your red capsule is 1.26-(0.65/2)=0.575. Very little space to place the legs (two capsules = 0.47 m (thigh) and 0.59 m (lower leg)). Curious anatomy: femur is shorter than the tibia . In my language there is a fun way to call this look with such "powerful" crotch. Curiously it refers to the character of lazy or slow person not to any sexual aspect. P.S. : I agree with your AimAssist clarification. I I forgot consoles!!!. So do we indeed have that many differenthitzones with different multipliers? Personally I think they ar overcomplicating their gun mechanics with all the new relevant weapon stats, the slower TTK and the different multipliers. Simple is better in my opinion because it is easy to understand for the player without needing to look up the stats, the multipliers and whatnot. BF4 had the same number of hitboxes as BF1. There's no real major difference here. There are two "entities" more: forearms, which did not exist in BF4. So the discussion of whether they are capable of stopping a shot to chest or not (the question of priorities). And the multipliers are applied to four categories instead of three as in BF4. Yes, it is a little more complicated now. Beside the discussion in progress on the position of the hitboxes. Ah yes, I see now. I missed those when I was earlier looking through the files. The reign of the magical ghost forearms is over! Well, bullets can certainly pass through hitboxes. IIRC in BF4, if the bullet passed through multiple hitboxes, it applied the highest damage multiplier to the damage of the bullet. I see no reason why it wouldn't work the same in BF1. In any case, this can easily be manually tested in-game.